A question that frequently comes up in clinic: What mattress do you recommend? Now the British Chiropractic Association have released this video as a guide to help patients on their way to finding a good mattress and sleeping positions. We all have our favourite sleeping positions, but some may be doing more harm than good. People who find it difficult to get comfortable don't have good quality sleep, as they are tossing and turning into weird and wonderful positions! Patients often come to see me with pain they have woken up with, or they're not quite sure how it started through the day. Very often this is caused by the way they have slept. This image illustrates some of the most aggravating positions that we can sleep in (front being the worst), and some options if you have back pain to keep you comfortable. REMEMBER DRINK PLENTY OF WATER! This helps us keep our muscles and joints hydrated and therefore pain to a minimum. AVOID SLEEPING ON YOUR FRONT! A lot of front sleepers present to us in clinic with chronic problems as it’s difficult to maintain a neutral spine position. Sleeping on your stomach forces your head and spine into an unnatural position, and staying in this position for hours on end is not good for your back or neck and can result is significant discomfort and restless sleep. Patients have seen great results from trying to change their habits. As I always say you can't control what you do in your sleep (especially snoring!) and it is hard to change the habit of a life time, but we can try and set up in a good sleeping position to avoid it. *Some patients tell me they find it hard to keep a pillow in place so suggest trying a longer body pillow or small folded quilt. This is especially good for front sleepers who want to avoid rolling. These illustrations demonstrate how an incorrectly placed pillow can stress the neck. On your back you need fewer pillows than on your side so if you change from on position to another bare this in mind. We are also all different shapes so the amount of support we need varies from person to person. 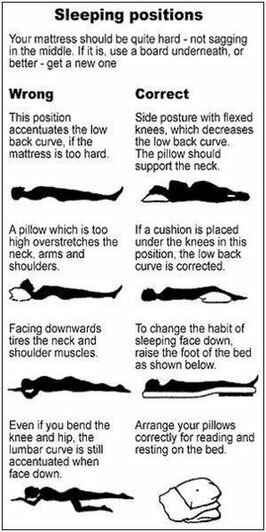 If you're a back sleeper I recommend using one pillow, thickness depends on the depth of your natural curves, and pull the lower corners around your lower neck so the pillow is no lower than your shoulders. For side sleepers, or those who tend to end up in this position, you need plenty of support so try two pillows, again the depth required depends on the width of your shoulders. Ensure you are not at the edge of the pillow and the lower front corner is pulled down to your shoulder and around the cheek. This will prevent you head dropping or rotating which can irritate the neck or lead people to sleep on their front.